A very brief history Amman is ancient. The first settlement goes back to 6500 BCE, without doubt because the folds of the seven hills on which the classical city was built provided both protection and a fertile area thanks to the stream that ran down to the Jordan river below what became the acropolis. Thanks to its location on the main trade route from Syria to the Red Sea, the city flourished. 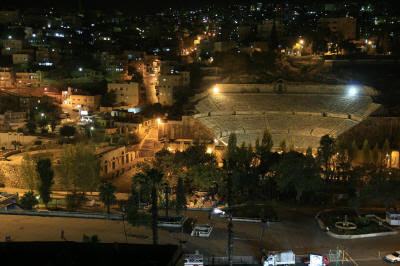 The Roman Theater and Assembly Amman, capital of the Ammonites, was occupied by the empires of Assyria, Alexander, Rome, Byzantium, Arab and Ottoman. The Romans built up the acropolis into a fortified castrum and temple complex, as well as constructing the Theater and the Assembly. In the 1200s Amman was wiped out by two events – the arrival of the Mongols and a series of devastating earthquakes. Like so many ancient cities in the Middle East, it never even came close to recovering. In the centuries of Ottoman rule, Amman was just a village, ignored but for the fact it still remained on the pilgrim route from Anatolia to Mecca. At the end of the 1800s the Sultan in Istanbul ordered the building of a railroad to connect Damascus with Aqaba. Amman was reborn. 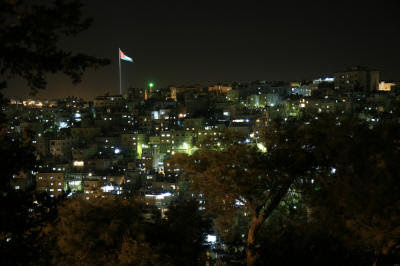 After the creation of Jordan in 1921 Amman was chosen as its capital. Since then it has boomed, the city of the original seven hills now rolling over nineteen, that stream now covered over by a road and used as a drain. If you want to know more about Amman, check out wikipedia. Amman by Night I arrived in Amman at night, waiting for the connecting flight to Baghdad the day after. I always try to walk around a place when I first visit - and I had spent more than twelve hours flying, so I had to get out of the hotel and stretch my legs. I dumped my bags, pulled out my camera and jumped into a cab. The driver had spent many years working in Los Angeles, so his English was perfect. Instead of dropping me off in the Old City and letting me walk around for a couple of hours and picking me up later, as I asked him, he drove me round the city to see not only the standard places all tourists see but also the different parts of the city as well – the new, the old, the residential and the commercial. This is what I saw: Amman by night At night Amman is a broad carpet of softly lit houses and streets laid over the folds of its many hills. The roads are both broad avenues, bright slashes of neon that outline the ridges and valleys, and narrow, crooked veins that wind around and slide down the hill sides. Most of the houses are freestanding and two-three floors high, their façades generally a soft limestone and each of them made individual by sculpted windows, balconies and porticoes. Sufyan, my driver, told me that the sense of well-being I see is in part due to the influx of relatively well-off people from Palestine (in 1948 and 1967), the Gulf (after the 1991 war) and Iraq (since 2003). Their money fed the building boom in Amman – and increased house prices considerably, especially in the last few years, a source of frustration locally as some have found themselves unable to buy their own place. By way of comparison, Amman is a bit like what remains of the old quarters in Rio de Janeiro, but without the degradation or poverty that those areas have fallen into. Or like some parts of European Istanbul, without the exposed cement blocks or anonymity of the buildings. Or like Ankara, rolling over everything in sight, with character but without the decay in Ankara's old city and sense of institutional soullessness in its new. The fortified acropolis for sure is like that of Ankara (or maybe even Jerusalem, but I haven’t been there yet) - or it would be if not ruined so - a battleship of rock whose prow juts over the heart of the city. I walked around an open area where once there were temples and churches but now is a parking lot for the buses that take the tourists to see some forlorn columns and into the fortress behind. Shot a couple of fotos of the Theater below and the city behind. The Amman of Today Walking around the area in front of the Theater, which is the only open space in the city (why is it that in the Middle East there are so few squares that are not simply zones for drivers to wrestle their cars through? ), I asked Sufyan about the Amman of today. Jordan’s business is agriculture and tourism. And phosphates – which the world needs for fertilizer (the Chinese are investing in upgrading the old Ottoman rail link to Aqaba). There’s very little manufacturing industry as the local market is small. Thanks to the nature and economies of today’s neighbors, the historic value of its location no longer helps export and commerce. So what do Amman’s youth aspire to? Mostly to work somewhere else for a few years – whether it’s in the West or in the Gulf. The education system turns out well trained, well qualified graduates, all of whom see the wealth brought into the country and most of whom aspire to the same material standards. The average salary is about 450 US$ a month; not enough to achieve the dream of a new house in a nice district, a new car, private education for the kids and a overseas vacation. Now here’s the interesting thing: Ammani men (at least) encourage their wives to work, on the principle that two salaries are better than one. I asked how the focus on materialism sits with traditional custom and religion (well I had to ask that, didn’t I). The answer: of their nature they don’t contradict each other, but where they overlap, then society is still working its way through a proper understanding and balance. My driver is a sage. 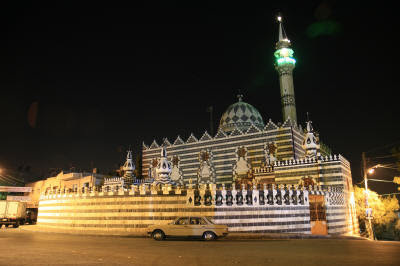 The Abu Darweesh Mosque Balance seems to be the underlying theme of Jordan. It is a new state, artificially constructed by the Brits after the destruction of the Ottoman Empire. It has had to find it way in a region wracked by imbalance. In an ancient place, old here means about fifty years old. The oldest townhouse was built in the 1890s (there’s even a banner proclaiming the old greystone so), the oldest usable mosque from about the same time. There seems to be balance in the city – no part is ostentatiously rich, no part indescribably poor. The king of Jordan does not live as luxuriously as the president of Egypt, but Jordanians earn more than Egyptians. At night the city feels at peace, its lights welcoming, not harsh like those of Dubai. Next time I’ll see Amman by day. Who knows, I’ll be a good tourist and get to Petra and the Dead Sea too.